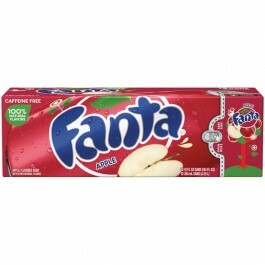 Fanta with apple flavor! Fill your fridge with this tasty soda. Carbonated Water, High Fructose Corn Syrup, Natural Flavors, Citric Acid, Malic Acid, Caramel Color, Sodium Benzoate and Potassium Sorbate (to Protect Taste), Sodium Citrate.